This silicone cup embraces half an avocado to keep the cut fruit fresh longer. A sliver on a taco, a spoonful in a smoothie, or a spread on toast: A little avocado goes a long way. Keep its other half fresh and intact with this form-fitting silicone cup. These huggers ensure that you're prepared to preserve your favorite fresh fruit, and the convenient pit pocket can be pushed in or out for the tightest possible seal. Made of BPA- and phthalate-free silicone in China. 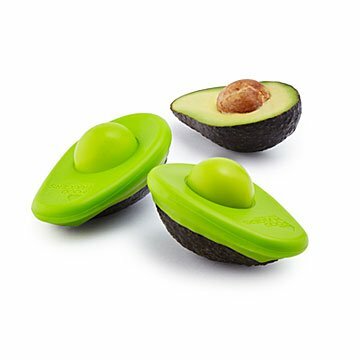 Pair your Avocado Huggers with our Food Hugger Set. I was really hoping this was the answer to brown avocados but unfortunately it really didn't work any better than wrapping it tightly in saran wrap, etc. Also, the small one was pretty much the average size of an avocado but the large one is gigantic... I have never seen a large enough avocado that would warrant using it. I honestly thought it would just be a little bigger, not inches bigger. I am disappointed and feel like it was a waste. This keeps the other half of the avocado fresh. I eat avocados almost daily, I really wanted these so my husband got me them as a gift for Christmas. I wanted to love them, but unfortunately I found them disappointing. Unless you have a perfectly sized & shaped avocado they just don't fit properly. They're difficult to get on around the edges around the avocado, I felt like I was smushing the avo trying to get it wrapped around. And they didn't keep the avo any fresher than a ziploc or Tupperware type container does. I actually felt like it was even slimier. And it says it's dishwasher safe, but I found if you don't pre-wash very well then they have to be hand washed again after the dishwasher... so what's the point, I ended up just hand washing and skipping the dishwasher. But now I don't even bother using them at all as they're more of a hassle to use than it's worth. I wasn't sure about these huggers, especially since other reviewers had some issues with the sizing. Lucky for me I am using both sizes successfully. I generally store overnight only but I forgot about a half that I had in the fridge and a day later it was only slightly brown on the top which I easily scraped away. Smaller size worked ok, a bit challenging with overly rip avocados. My Mom loved it and thought it was clever. So disappointed. We really wanted this to work and I'm shocked that it seems to for many people. We've tried it multiple times with different avocados. Every time when we take the hugger off, the remaining avocado is brown and unusable. Complete wast of money for us.